Symbolist poet Andrei Bely’s recitation of his 1911 poem “A Voice from the Past,” replete with roiling, rolling r’s, conjures the feel of fog and the sound of swords of knights from far-away lands galloping north to save a princess. “A Voice from the Past” is from Bely’s “fairytale” cycle “The Princess and the Knights,” which was inspired by his first wife, Anna Turgeneva. Bely is probably best known in the West for his novel Petersburg, a favorite of Vladimir Nabokov’s: Petersburg evokes (among other things) revolutionaries, a statue freed from its pedestal, and lots of colors, (as befits Bely’s symbolist leanings), including, of course, red. By the way: John Elsworth’s translation of Bely’s Petersburg won two translation awards in 2012: the Read Russia Prize and the Rossica Prize. 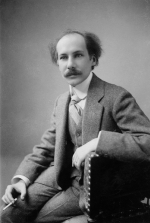 Photo of Andrei Bely (1910s) from Wikipedia, Creative Commons. Audio of Andrei Bely reading "A Voice from the Past"
Listen a Little, Laugh a Little, Live a Little! We love humor here at Read Russia so we’re happy Russian literature has found so many ways to amuse us with everything from eighteenth-century epigrams to post-Soviet absurdity. 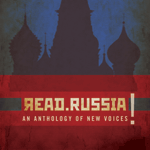 Pushkin and Gogol were born a little early for audio recordings but this set of clips offers up voices of three twentieth-century Russian writers especially noted for their satirical humor. “The Affidavit” in English translation, in Nervous People and Other Stories, on Google Books, translated by Hugh McLean and Maria Gordon. Futurist poet Vladimir Mayakovsky recites, dramatically and sometimes almost singing, his 1920 “An Extraordinary Adventure that Happened to Vladimir Mayakovsky One Summer at a Dacha.” The dacha was in Pushkino. World War 2 ended nearly six decades ago but the war continues to play a huge—and very emotional role—in the Russian arts, appearing in films and books about the wartime and post-war traumas of losing millions of soldiers and civilians, as well as the glory of Soviet military operations like the Battle of Kursk. These audio clips highlight Russian poets and performers who were involved in World War 2, either on the military front or the home front. Olga Berggolts and Vera Inber both lived in Leningrad during the 900-day siege of 1941-1944, writing prose and poetry about the war and its human toll, and receiving medals for their service to the city. Berggolts’s “Submarine” poem (below), dedicated to a submarine captain, is decidedly military, and Inber’s prose, Leningrad Diary, and long poem, “The Pulkovo Meridian,” both describe the siege. Film actress Tamara Makarova spent much of the blockade in Leningrad, too, and was also recognized for her service to the city: her contributions included nursing and helping organize the city’s defense. Makarova and her husband, director Sergei Gerasimov, worked on many movies together, including 1943’s Invincible, about the war. The popular comic actor Yury Nikulin fought in the war, getting his start as a performer during an R&R visit to Latvia. Here are audio pieces from four artists whose lives and careers were shaped by World War 2. Photo: Wall at Piskarevskoye Cemetery with Olga Berggolts's words. Photo from Volkov, via WIkipedia. Olga Berggolts (Bergholz) reads her poem “A Submarine Goes Out on Maneuvers,” written in 1942 in Kronshtadt. Berggolts is known for her poems about Leningrad during the siege of 1941-1944 as well as her radio work during the blockade. Berggolts’s words—ending with the famous “Nobody is Forgotten and Nothing is Forgotten”—are engraved on a granite wall at the Piskarevskoye Cemetery, where hundreds of thousands who died during the war are buried. Comedian Yury Nikulin, one of Russia’s most beloved performers, speaks about the role of World War 2 in shaping him, first noting how strongly his generation wanted to join the army, then describing how he first began performing, during an R&R and regrouping visit to Latvia in 1944. Nikulin was given an assignment to organize a variety show—because he was jovial and knew a lot of jokes—then decided to take part himself, including in a popular clown number. Vera Inber reads her 1927 lullaby, “To a Son Who Isn’t,” which begins with “Night comes on soft paws, Breathing like a bear…” Inber lived in Leningrad during the blockade of 1941-1944 and wrote poetry and a diary about those years. Tamara Makarova, sometimes called a Russian Greta Garbo, speaks about film's role in society, saying she acted in pictures with moral messages and noting that young people often wrote letters, saying they wanted to be as brave as movie characters. Makarova was married to director Sergei Gerasimov and starred in many of his films. They remained in Leningrad for much of the siege: Makarova received awards for serving the city's defense. These three poems show two sides of Boris Pasternak: poet and literary translator. Pasternak is best known in Russia for his poetry, particularly the collection Сестра моя – жизнь (My Sister, Life), though he is most famous in the West for Doctor Zhivago, which contains some of his finest poetry, the poems of Yury Zhivago, a generous literary gift from Pasternak to his fictional, alter ego of a doctor. Like much of Pasternak’s poetry, “Night” and “In Hospital” both present the world from unusual angles: “Night” examines Earth and an artist from the sky and “In Hospital” looks at illness, dying, and a conversation with God that concludes with the dying man seeing himself as a ring in a case. Ann Pasternak Slater’s “Translating Pasternak,” which mentions the poem’s sounds. 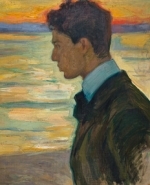 Image: "Boris Beside the Baltic at Merekule," 1910, painted by Leonid Pasternak, Boris Pasternak's father. Boris Pasternak reads his 1957 poem “Night,” which offers a view of the earth—and art—from a night sky. Pasternak’s “Winter Night,” a poem with a similar title, may be one of his best-known in the West because it appears in <i>Doctor Zhivago</i>, as a poem written by Zhivago himself. Boris Pasternak recites his 1956 poem “In Hospital,” written after a hospital stay in the early 1950s. We have Thomas Edison to thank for these recordings of Lev Tolstoy! After Edison sent Tolstoy a phonograph that the writer received in January 1908, Tolstoy sometimes recorded his voice on wax cylinders, saying it was easier and faster to answer letters by speaking into the phonograph than to write on paper. Tolstoy also made special recordings for Edison, at Edison’s request, in multiple languages, though, according to RIA Novosti, it appears that most of the cylinders did not survive. Though very brief, the ten clips we’ve posted here—all recorded in 1908 and provided to us by archivists from Gosteleradiofond—capture a surprisingly broad range of Tolstoy’s life and thought. Tolstoy speaks about art, law, and moral issues, touching on his moral crisis, activity the government saw as subversive, and poverty. There is also an excerpt from “I Cannot Be Silent,” a well-known tract about nonviolence and capital punishment that was censored, as well as a brief speech to a group of boys who studied at the Yasnaya Polyana school. He tells them to behave. A bit more background: Edison sent the phonograph after Stephen Bonsal of The New York Times visited Tolstoy in 1907, offered to get him a phonograph, and made the order through a friend. Edison, though, refused payment. Photograph: Lev Tolstoy, taken by Sergey Prokudin-Gorsky, via Wikipedia. In less than 30 seconds, Lev Tolstoy sums up his thoughts on art and civilization: he says art should be based on ideals and he decries the lack of true art works in his time, believing there is only play of words, sounds, and imagery. Nikolai Guseev, Tolstoy’s secretary, wrote in his diary on February 9, 1908, that he transcribed Tolstoy’s words in this recording. Lev Tolstoy tells a brief story about a man who is rich but becomes poor when his house burns and he isn’t paid for his work… but he later realizes his life isn’t so bad. Lev Tolstoy reads a letter to Vladimir Sheierman, a Kharkov landowner who was exiled in 1906 after he was arrested for instigating an incident in a neighboring village; he returned in 1907. Tolstoy and Sheierman corresponded about issues related to land and peasants. At the end, Tolstoy says he regrets the two have never met. 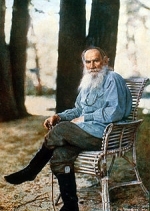 Lev Tolstoy reads a fragment of a letter, dated April 7, 1908, to Mitrofan Dudchenko in which he says he is unable to follow Dudchenko’s advice, though he says he will be grateful to whomever helps him find the way to do it. Dudchenko had previously written to Tolstoy, advising him to live his live in accordance with his convictions. Dudchenko and his brother Tikhon were both followers of Tolstoy. Lev Tolstoy reads the text of a letter to Nikolai Davydov, asking Davydov for advice regarding a person close to him accused of a book-related offense: the person was Vladimir Molochnikov, who was accused of distributing Tolstoy’s books. Davydov advised Tolstoy against traveling to St. Petersburg to defend Molochnikov, who was subsequently sentenced to one year in prison, making Tolstoy regret his decision. This clip of Lev Tolstoy’s advice to Russians, recorded in August 1908, also criticizes the government, blaming it for poverty and lack of freedom, and concluding, before cutting off, that the state of affairs is such that the very worst is considered the very best. In a brief bit of advice to boys studying at Yasnaya Polyana, Lev Tolstoy thanks them for coming to see him, says he’s happy when they do well in school, and tells them not to misbehave. Lev Tolstoy, in a small chunk of a letter to a student named Mikhail Loskutov, speaks of art and decadence. Tolstoy’s letter is an answer to Loskutov’s question about whether decadence is a form of decline or rebirth. Lev Tolstoy, in a small piece of a letter to a student named Mikhail Loskutov, once again speaks of art and decadence, saying that decadent art appeals only to a small circle of people. Tolstoy’s letter is an answer to Loskutov’s question about whether decadence is a form of decline or rebirth. In yet another brief letter, Lev Tolstoy thanks Pavel Voronov for a package (not yet received) from a journal. He promises to read the journal. Voronov edited the journal Русская старина (Russian Old Times).